Isn't it pretty? We made this cupcake tower for a 60th birthday. 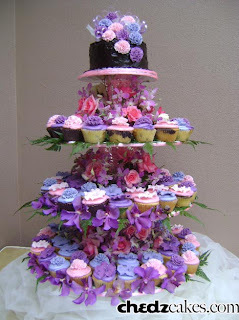 Each cupcake had hibiscus and carnation sugar flowers (lavender, pink and blue). We covered the top cake in chocolate frosting and decorated with a bouquet of cascading sugar flowers. 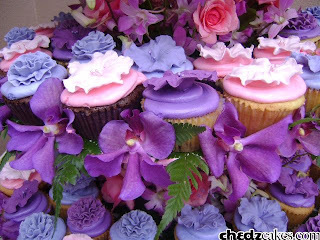 Then we added in fresh flowers to match the cupcakes.